“We present the Canadian flavor in our Canadian Christmas theme colors of Red, White, Gold and Silver. Each color brings in its own importance and blends in with our Dear Lord’s message of life. (source – heading of – The main photo of that site shows Jesus (with a twin goatee beard) beside Sathya Sai Baba. Makes those who know what Sai Baba really was and did think that the two were really totally incompatible and worlds apart. Note also that Sai Baba did not identify those colours as symbols of the four qualities that is claimed above. He did however say that you can see the moon only with the help of Moon Light, which is a classic blooper so typical of his ignorant glibness (for Sai devotees who know no better, it is the sun that makes the moon visible). Of course, the four named colours are taken throughout the world to symbolise a very wide variety of differing and often opposing ideas, feelings, values, conditions etc. Sathya Sai Baba: Christmas 2000 Discourse The infamous Christmas discourse of 2000 where he scourged his critics unforgivingly and lied blatantly about them. Sai Baba- Christmas not remotely as it was. 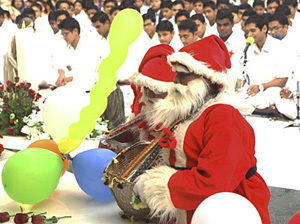 Sai Baba Christmas 2010 unforgiving hypocrisy, Santa Claus & blunders. This entry was posted on December 23, 2014 at 9:26 pm	and is filed under Sathya Sai Baba. 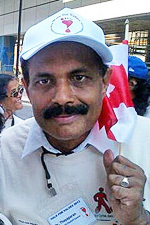 Tagged: Arumugam Thayaparan, Canadian Sai Council, Dr. Thayaparan. You can follow any responses to this entry through the RSS 2.0 feed. You can leave a response, or trackback from your own site.